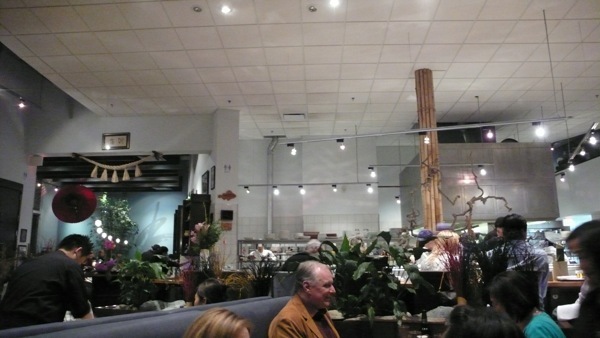 The room itself is large and rather generic, with the sushi bar in a large half-circle at the center. A few booths for large parties are in the restaurant’s perimeter with tables crammed close together throughout the rest of the restaurant. For such a high-priced place, Tojo’s doesn’t have much of a feeling of specialness about it. 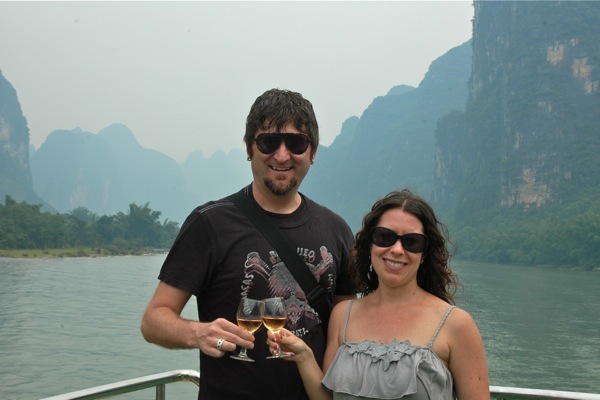 It pretty much could have been any sushi joint anywhere (until you see the bill!). 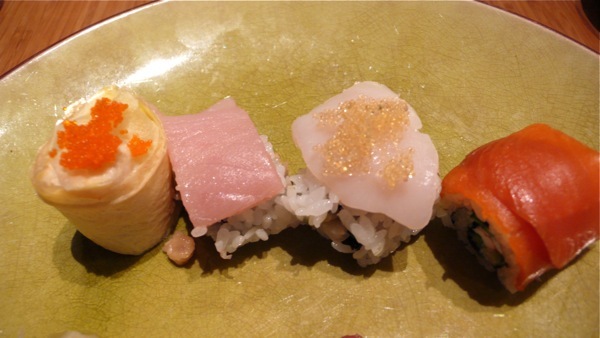 We ordered the least expensive omakase at five courses for $80 per person. The first course was two kinds of tuna tartare with shiso leaf root, cucumber, and scallion in ponzu sauce topped with grated ginger. 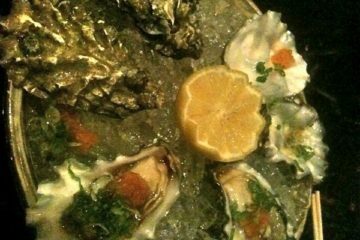 While the tuna tartare tasted fresh, unfortunately the acidic, salty sauce overpowered the fish. 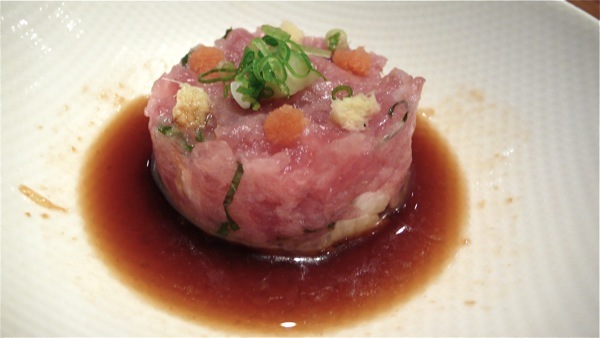 Tuna tartare with shiso leaf root, cucumber, and scallion in ponzu sauce. Sadly, an overpowering sauce was a theme we noticed throughout our meal. The next course, thinly sliced octopus in very spicy yuzu sauce with daikon radish and two kinds of seaweed, also suffered from a too-heavy, too-spicy sauce that masked the delicate flavor of the octopus. 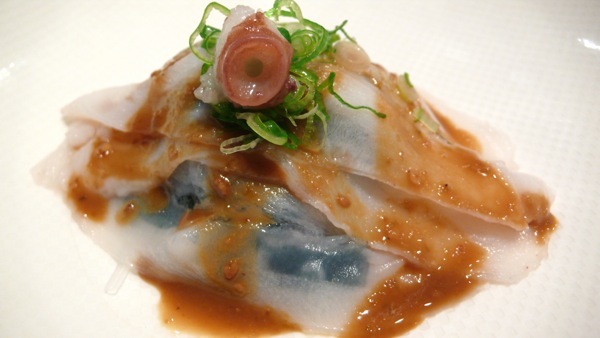 Octopus in yuzu sauce with daikon radish and seaweed. 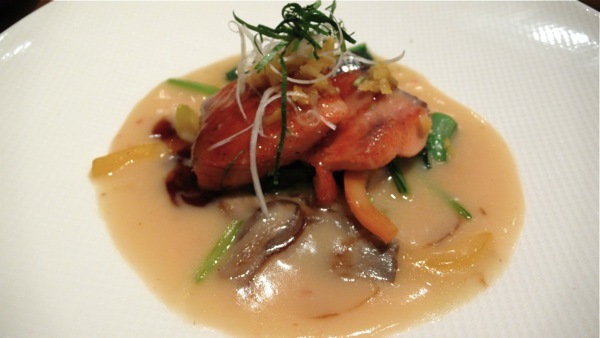 Sockeye salmon in miso sauce with mushrooms, bell peppers, baby spinach, and bell peppers. Next we were served more tuna, this time wrapped in seaweed and tempura with sour plum sauce, marinated mushrooms, and shiso leaf. Though I’m not usually a big tempura fan, this time the delicate flavors of the dish worked well together, with an added grassy, woodsy note from the mushrooms. 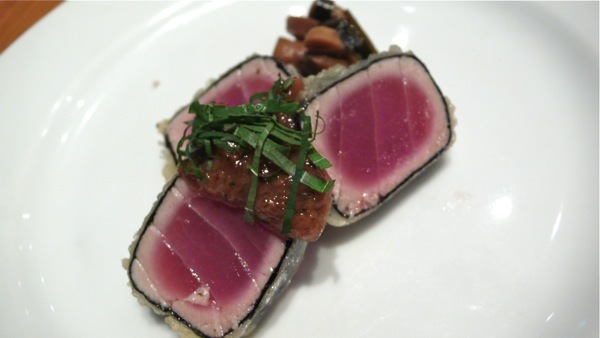 Tuna in seaweed and tempura with sour plum sauce, marinated mushrooms, and shiso leaf. We also need to mention that the pacing of the meal was way off. We waited for a long time between each course – and after we had the tuna, we waited even more. And waited. Until we finally had to flag down our server and ask if we had more coming – specifically sushi, which we’d been waiting for the entire meal. Luckily, the next course (when it did come), was the sushi. Unfortunately, like the rest of the meal, many of the sushi selections seemed overly complicated and overdone, with sauces that were too heavy and masked the naturally delicious fish flavors. The first was a piece of a roll with smoked salmon on the outside and lobster and asparagus on the inside. This one had a nice smoked salmon flavor, but the lobster taste was too subtle. We also had red snapper, with a very mild taste; another sushi roll piece with scallop on top and Dungeness crab inside, which I thought had too much mayo mixed with the crab; yellowtail, which was a tasty piece of fish but with extra shiso and wasabi that wasn’t needed; spicy tuna with white tuna on top, which had an unpleasant mushy texture inside; and scallop wrapped in tamago, which once again had too much mayo inside. It’s saying a lot that our favorite course at this renowned fish restaurant just may have been the only non-fish dish: the dessert. It was a black sesame panna cotta with a sesame cookie. 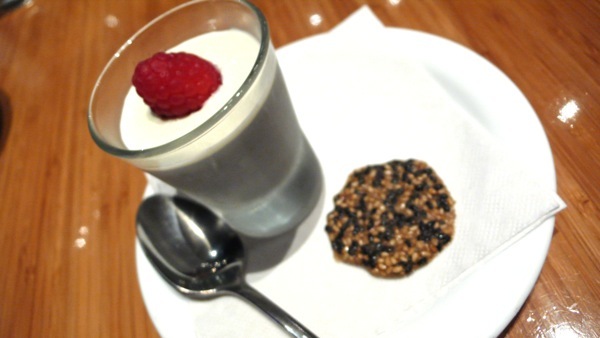 Black sesame panna cotta with sesame cookie. Why did we like this so much? It was rich but not too sweet, and because it was not topped with a superfluous sauce, the halva-like flavor shined through. The dessert was simple yet delicious, as we only hoped the rest of the meal at Tojo’s would have been. Open Monday to Saturday starting at 5pm. 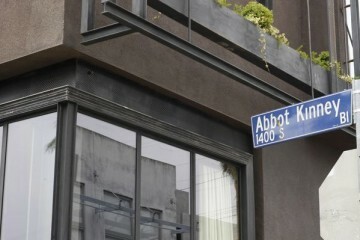 Reservations essential, ideally two to three weeks in advance.